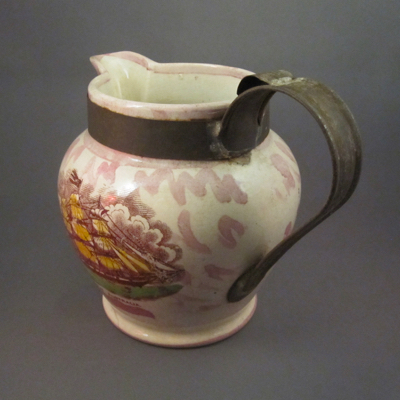 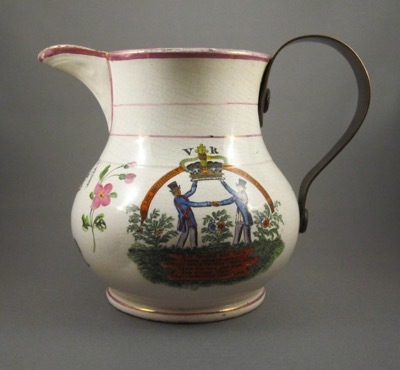 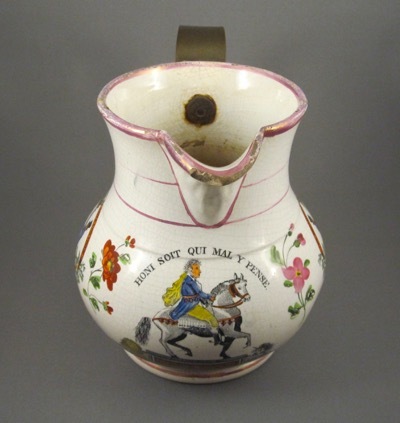 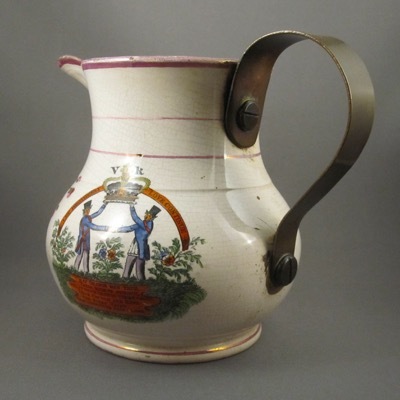 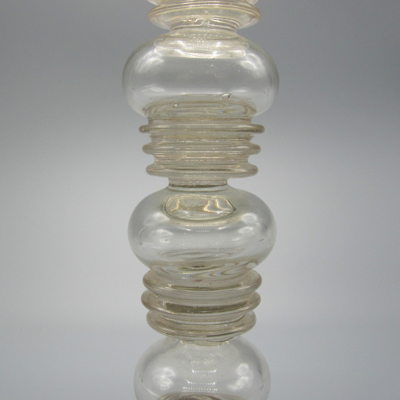 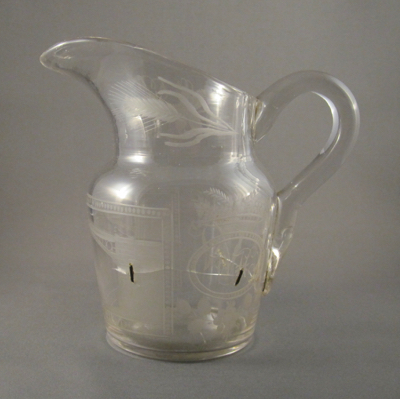 This unusual hand blown commemorative glass jug with applied handle was made in England around 1840 and stands 6-1/4″ high. 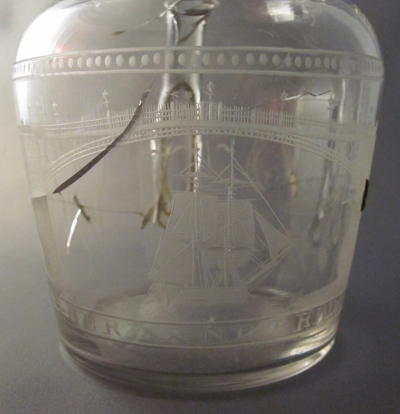 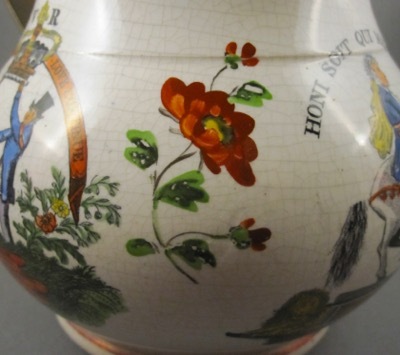 It features beautifully engraved images including a frigate in full sail under the Wearmouth Bridge in Sunderland, an oval cartouche with “WH” monogram, an elaborate fruit basket, a spray of wheat, roses and grapes. 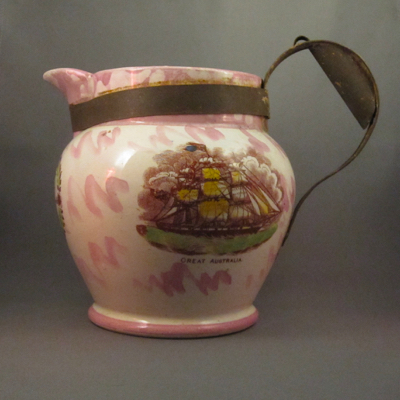 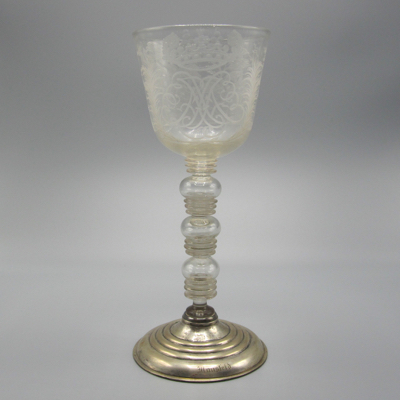 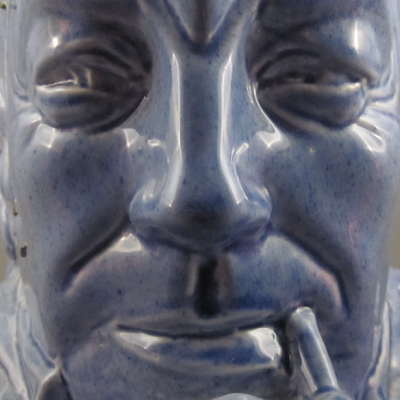 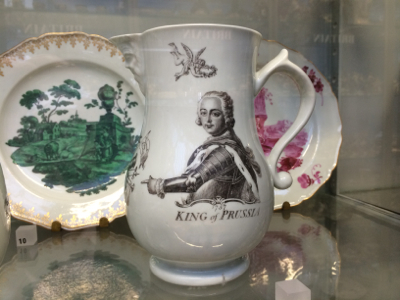 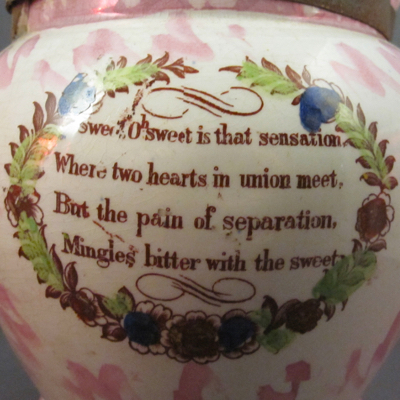 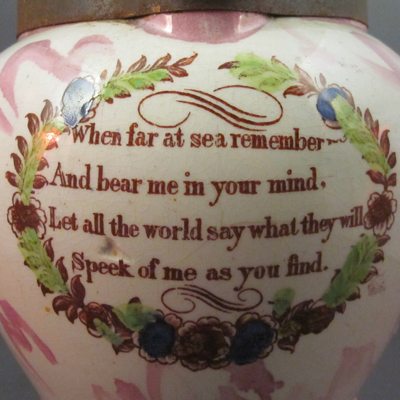 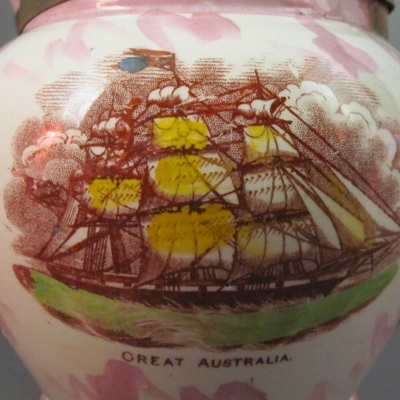 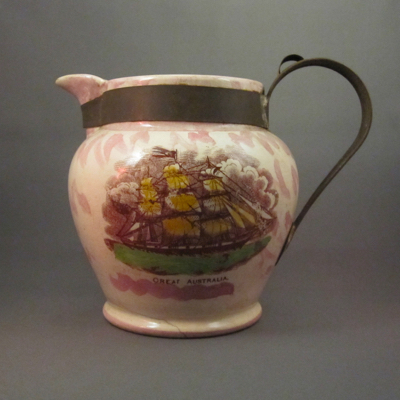 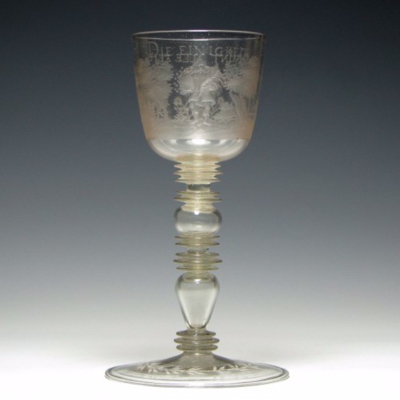 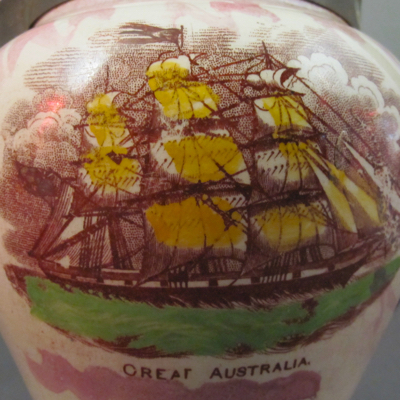 Examples of Sunderland souvenirs made of glass are more unusual than the popular pottery pieces with colorful transfer decoration, overglaze washes and pink lustre highlights. 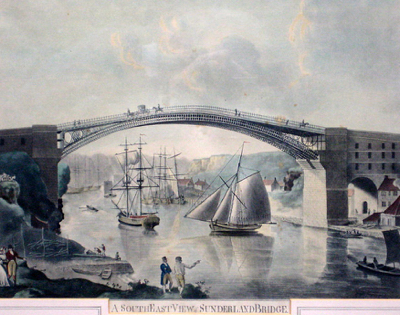 The Wearmouth Bridge was completed in 1796 but was still being commemorated well into the middle of the 19th century. 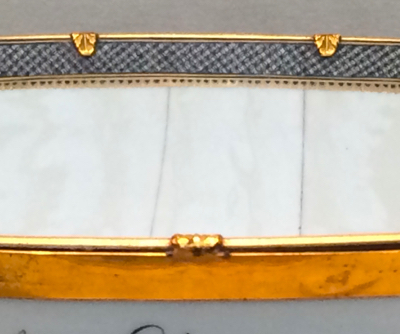 When opened it was the longest single span bridge in the world. 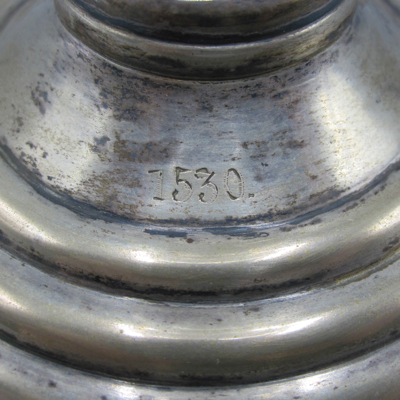 The original bridge was replaced in 1929 and is still in use today. 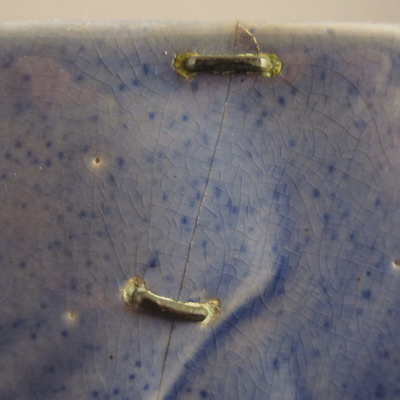 It must have taken a skilled hand to stabilize the large horizontal crack using just 5 metal rivets. 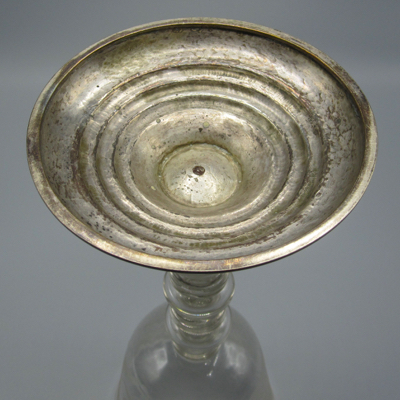 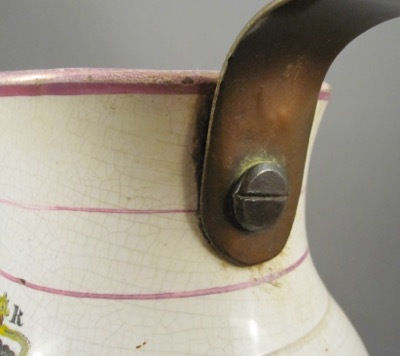 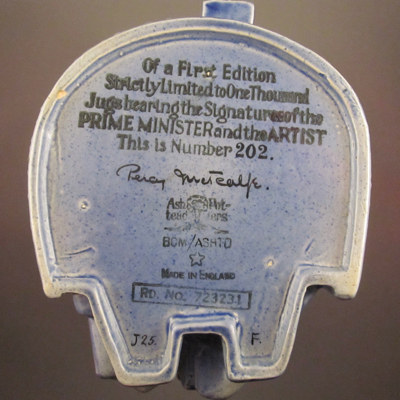 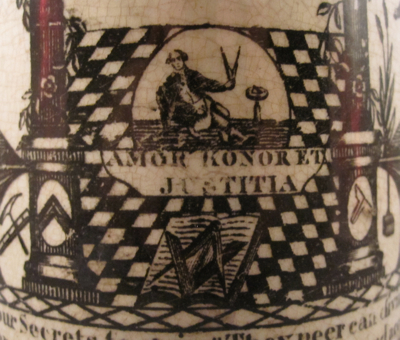 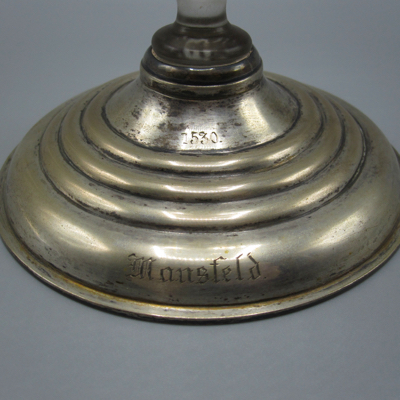 The underside reveals a ground pontil mark, as well as scratches and wear, showing that this jug has been well used. 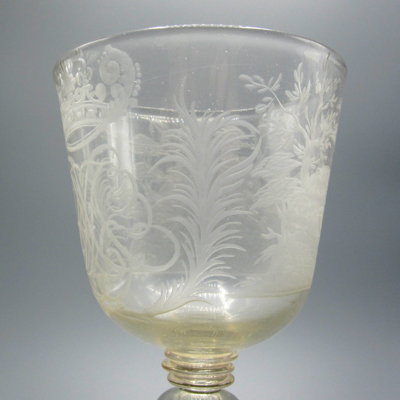 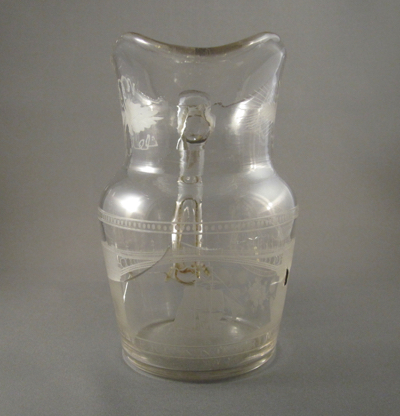 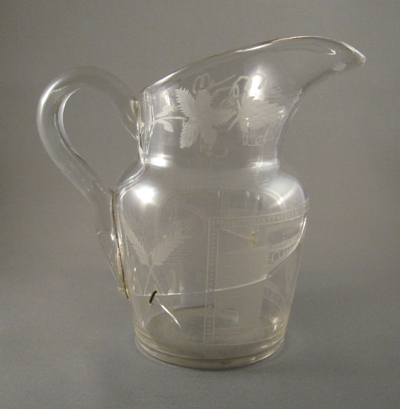 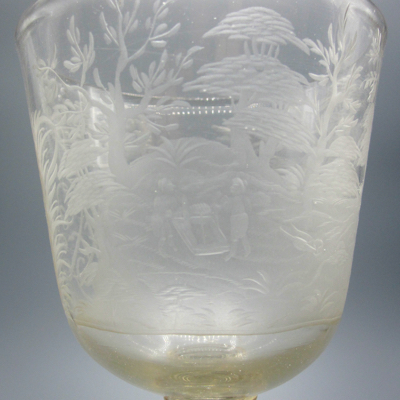 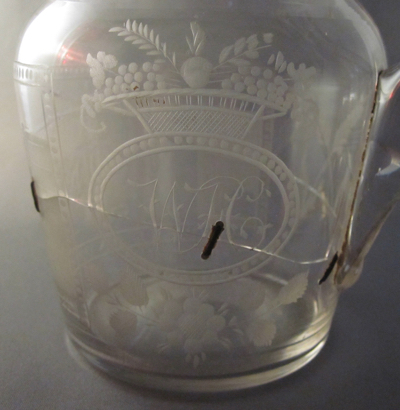 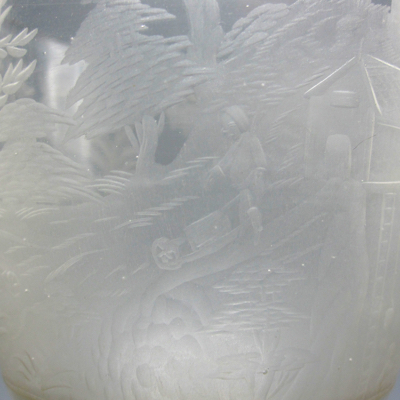 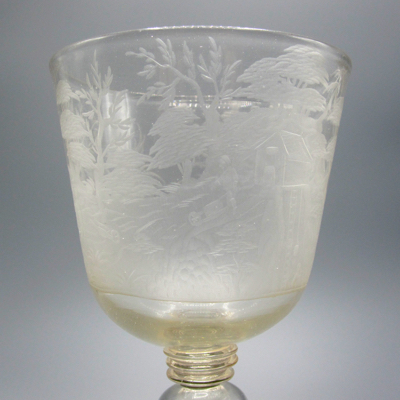 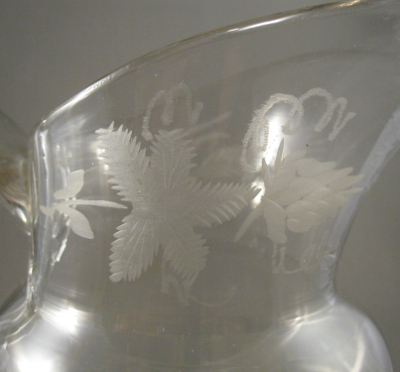 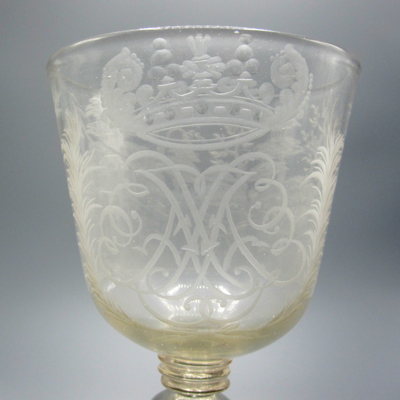 But it’s remarkable that a fragile glass jug such as this hasn’t sustained even more wear and damage over the past 175 years. 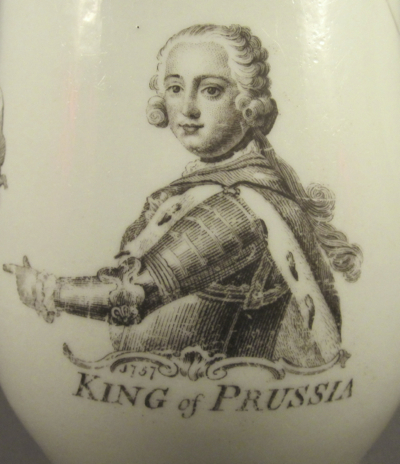 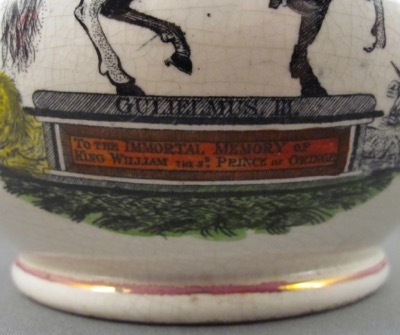 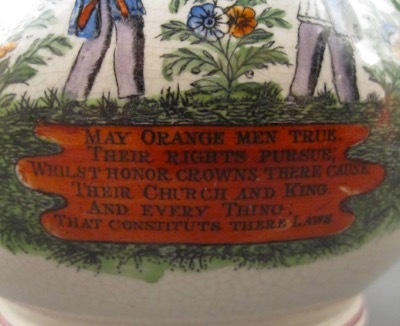 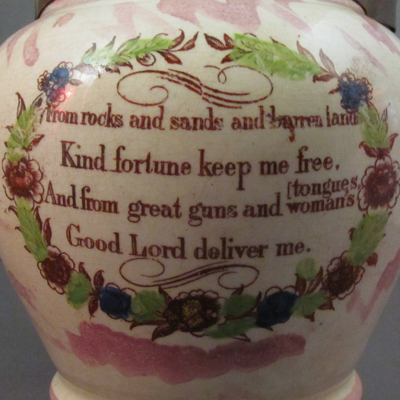 I am a big fan of commemorative pottery, particularly ones with strong graphics and bright colors. 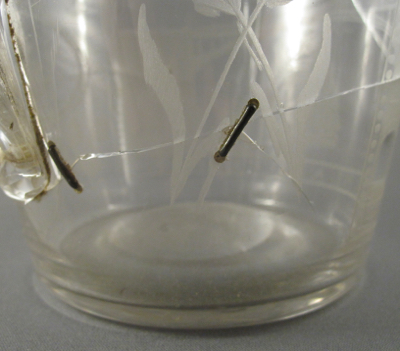 Whenever I spot an example from afar in a shop, I secretly hope that it has some sort of inventive repair. 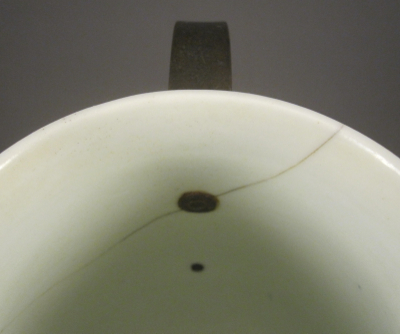 Sometimes I get lucky. 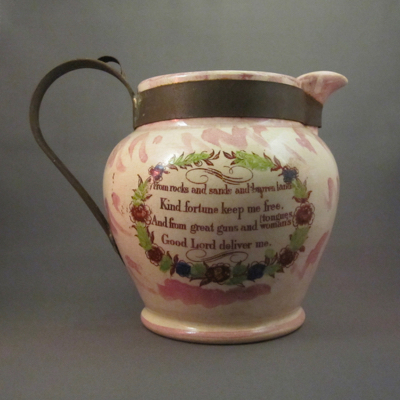 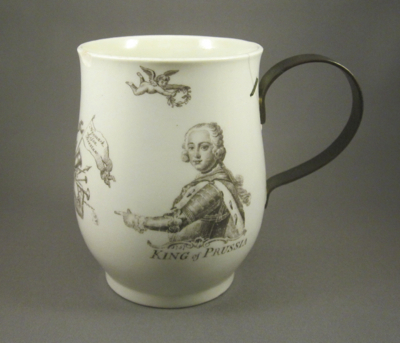 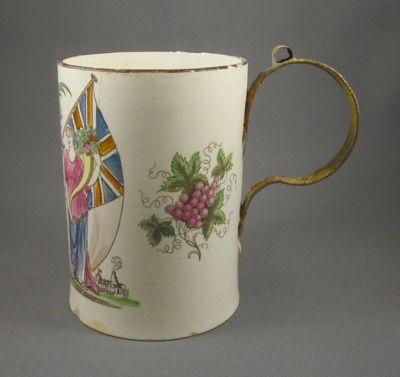 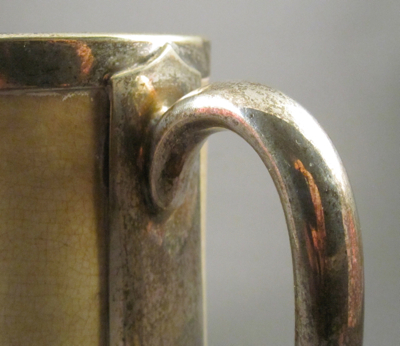 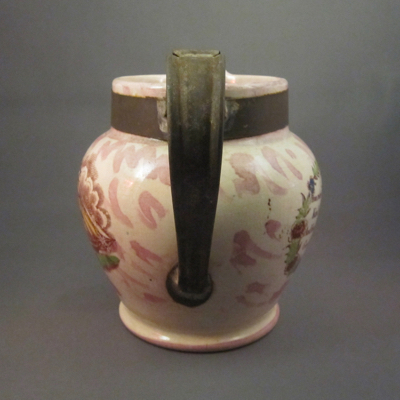 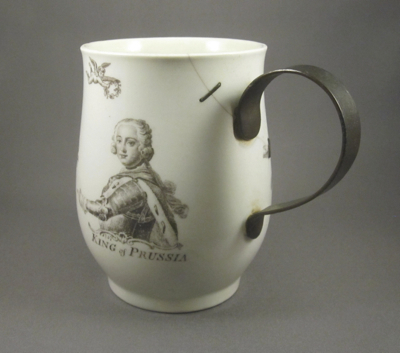 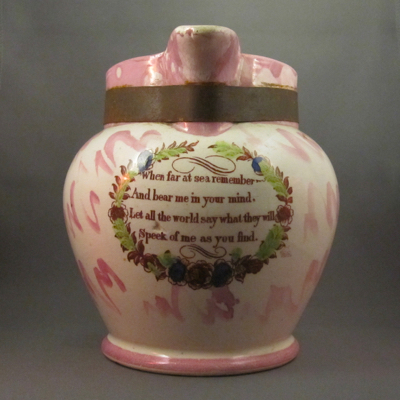 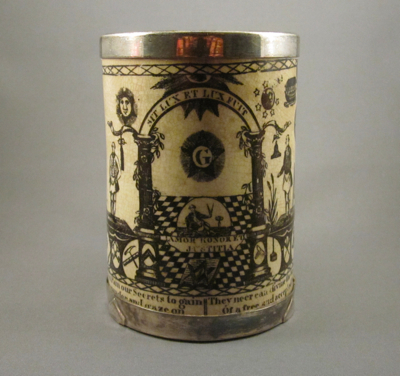 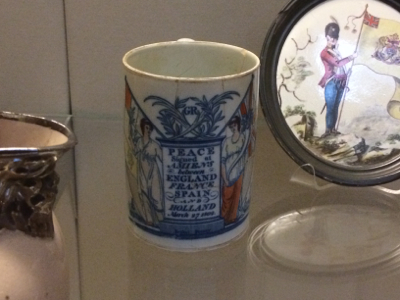 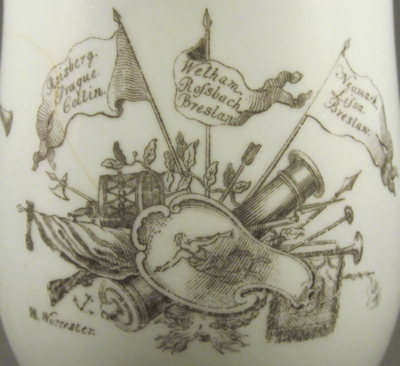 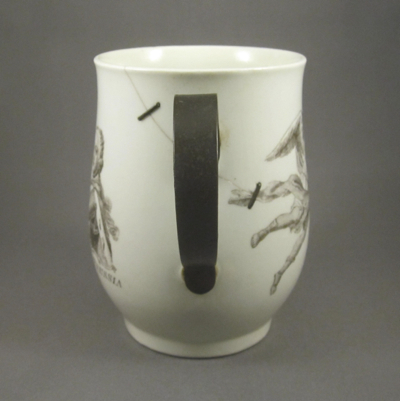 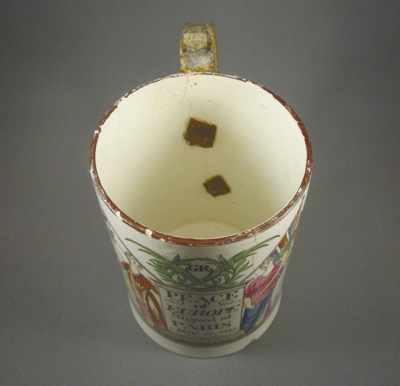 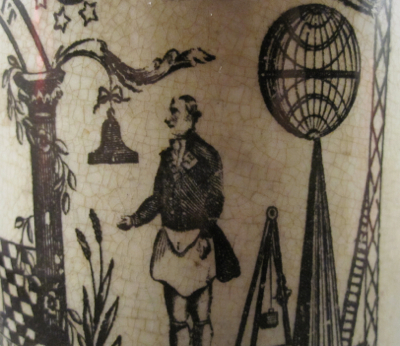 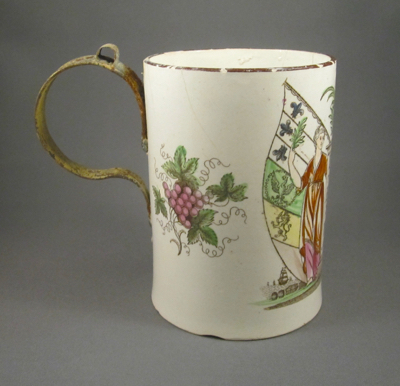 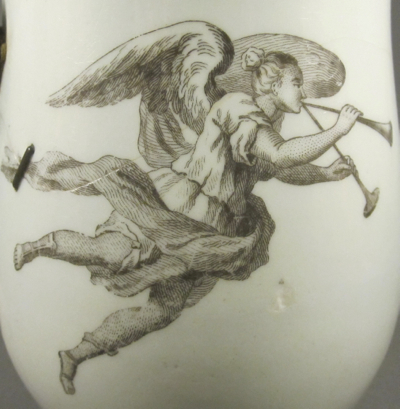 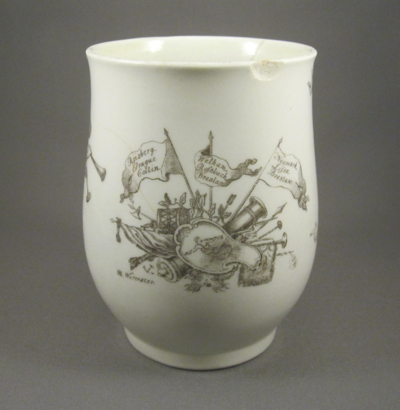 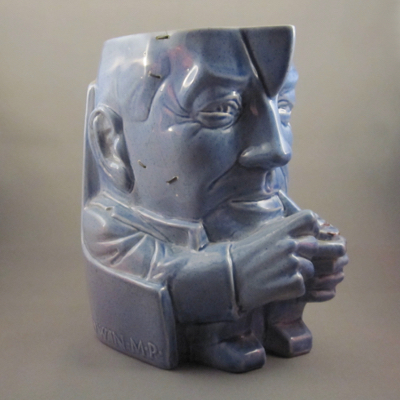 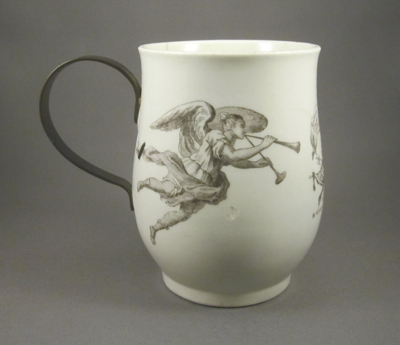 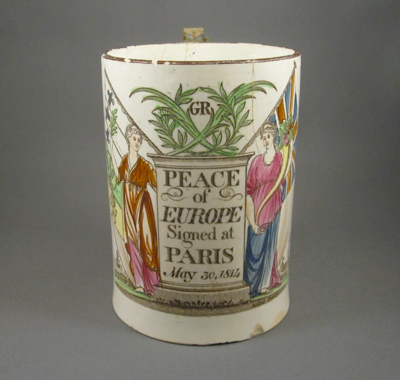 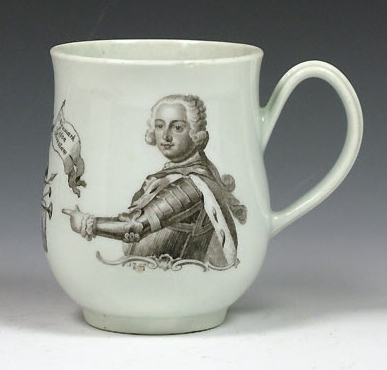 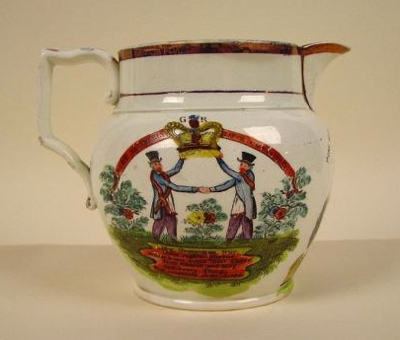 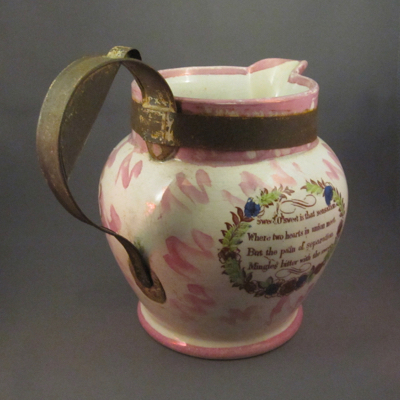 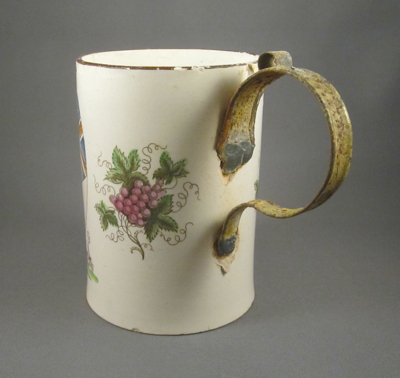 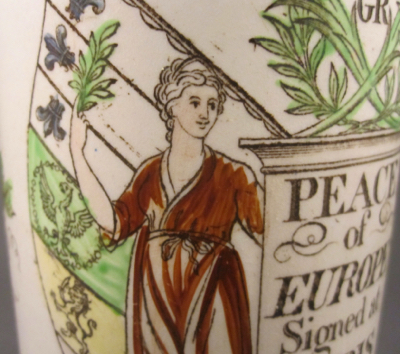 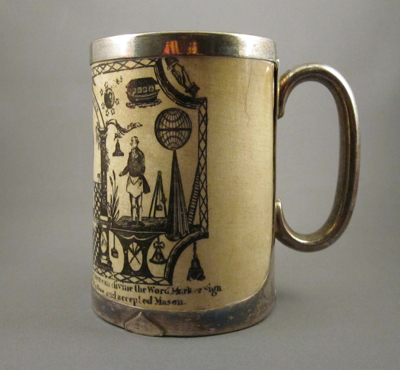 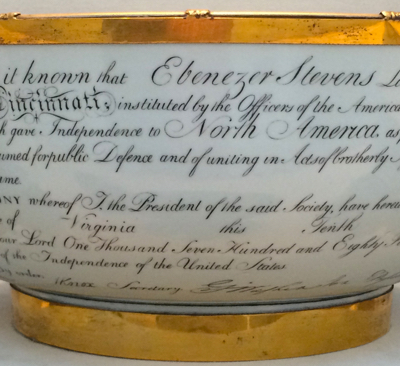 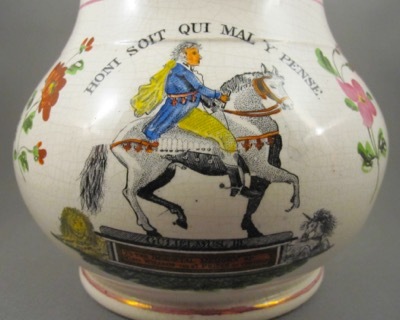 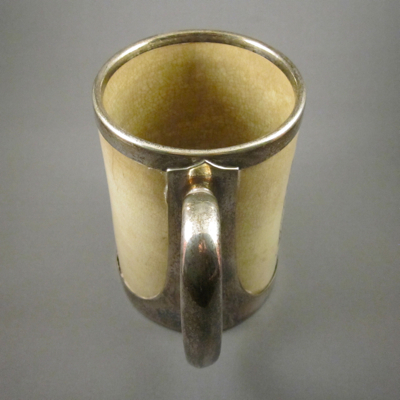 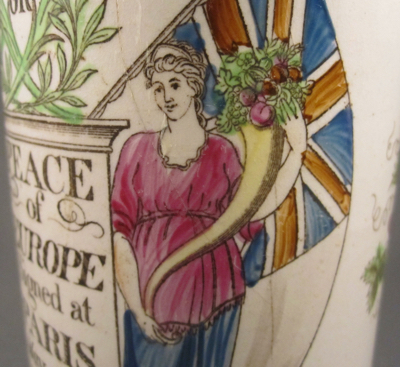 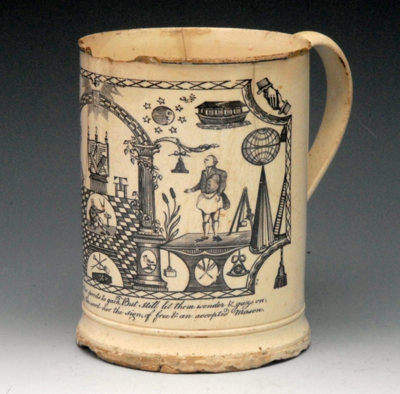 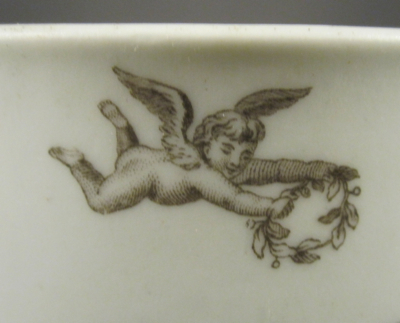 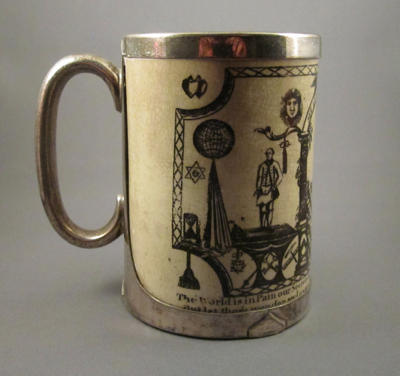 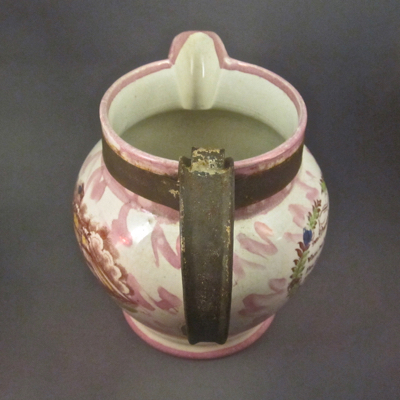 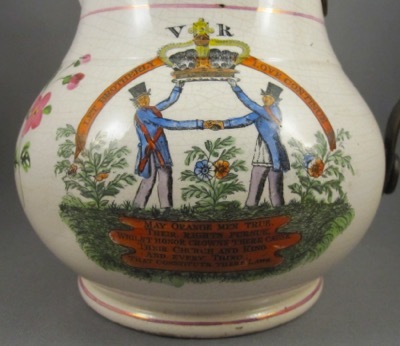 This creamware mug with printed transfer and hand colored decoration boasts the message “Peace of Europe Signed at Paris May 30, 1814.” Made in 1814 by Bristol Pottery in England to celebrate the signing of the peace treaty marking the end of war with France, this mug measures 4-3/4″ tall and 5-1/4″ wide to end of handle. 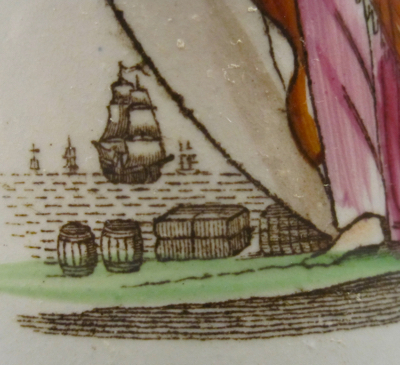 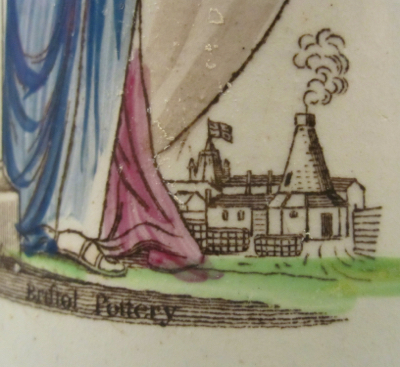 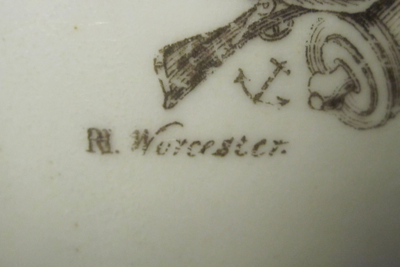 Check out the details in photos showing the Bristol Pottery mark, the factory in the background, and ships with wood crates no doubt filled with pottery for export. 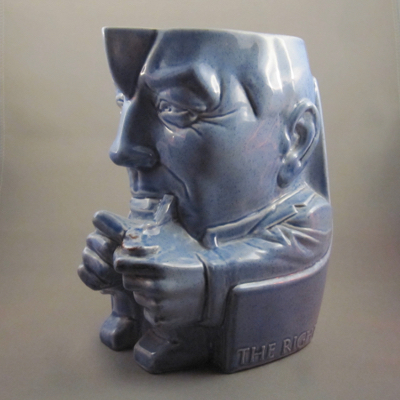 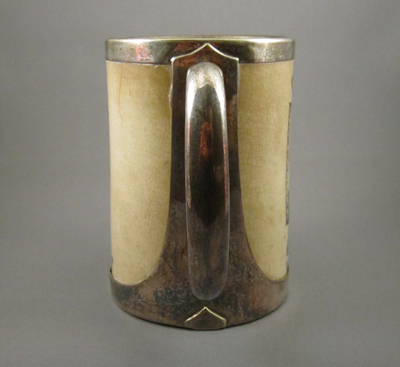 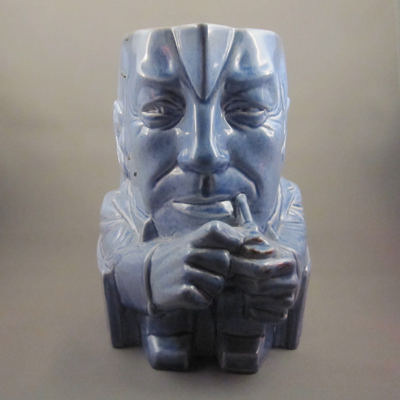 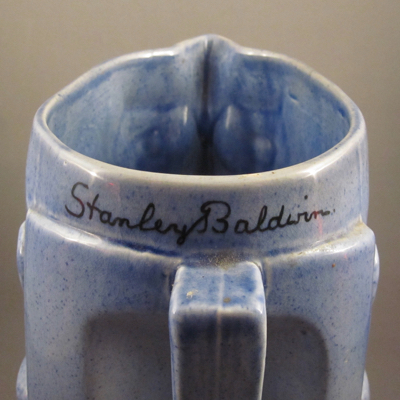 This mug possesses numerous battle scars, including chips, cracks, and the loss of its original loop handle. 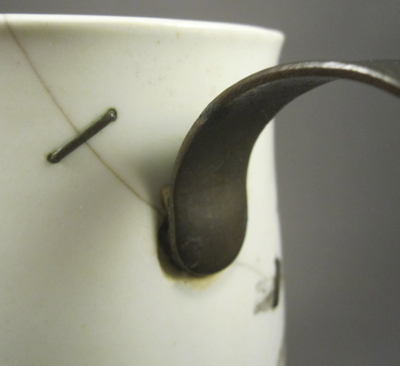 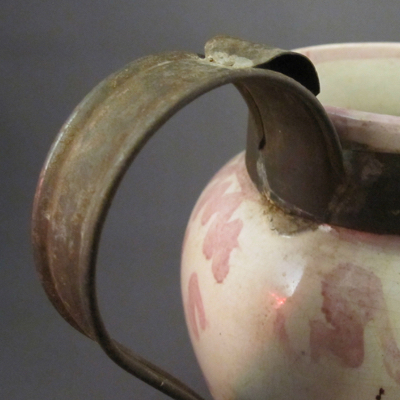 After the handle broke off, a 19th century tinker replaced it by drilling through the body and attaching a metal replacement with two square fasteners. 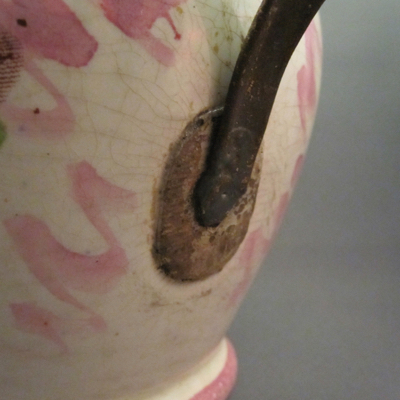 To add insult to injury, the replacement handle is covered in rust, a result of further neglect. 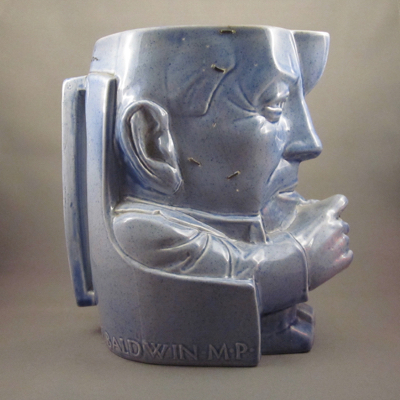 But if this mug were in “perfect” condition, I would not have purchased it. 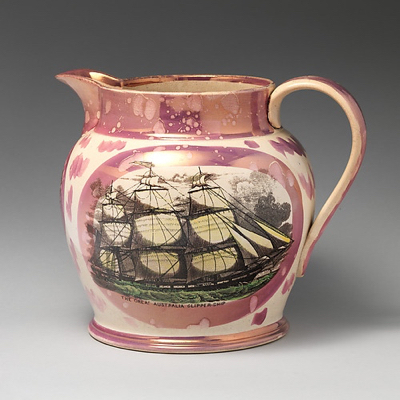 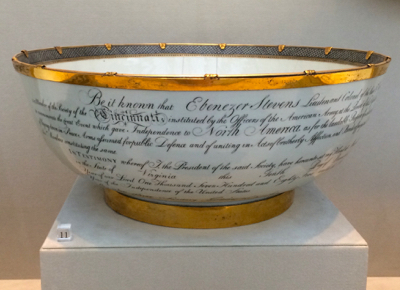 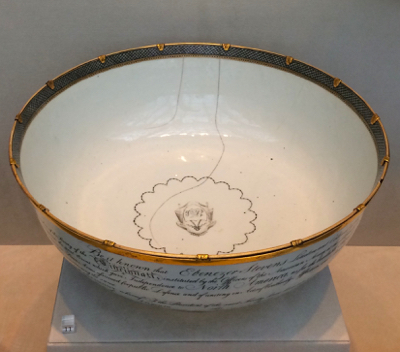 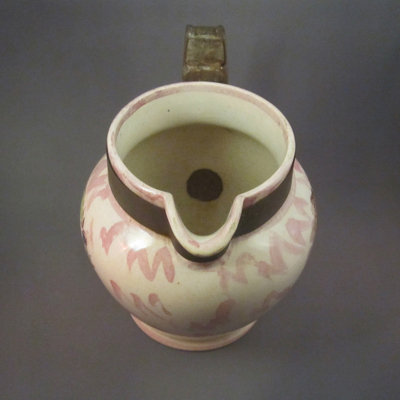 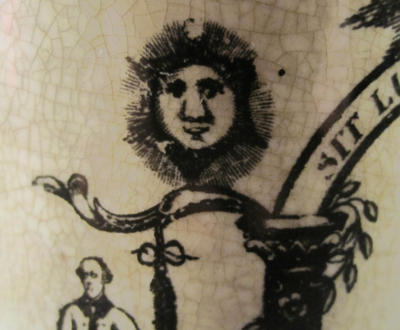 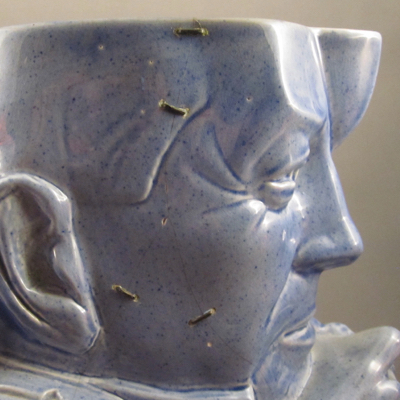 This example, with different copy and overglaze coloring, can be found in the collection of the British Museum in London.